The 5-2 Diet – a Lifestyle Choice? When Michael Mosley’s Horizon TV programme about the 5-2 Diet first aired, some months ago now I watched, fascinated. Many of the diet and nutrition ideas I’d grown up with, like eating three balanced meals a day and never eating less than 1000 calories a day, seemed to be thrown out of the window. And, if Michael Mosley could improve his health overall in addition to losing weight, just by being (very) careful on two days of the week, well why shouldn’t try and see if I could do the same by following the 5-2 diet? My mother had uncontrolled diabetes and died from some of the complications that arise from that condition. My grandfather had Alzheimer’s. I don’t really have a family history of good health. Both of these conditions are claimed to improve by following the 5-2 diet. And, my lifestyle doesn’t really help with most diets – I often eat out two or three nights of the week – with the result that I’ve put on weight and developed something of a taste for rich food. So, I thought, it would be really worth having a go at the 5:2 diet and seeing if it could work for me. And I’m rather enjoying working on some 5:2 diet recipes in the process. The results? Well, I’ve lost about 12lbs since I started doing this in late August. And I’ve managed not to gain weight when I’ve been abroad, despite the focus of my trips being food and drink. I might have lost more weight over the 5 months but I’ve had a few breaks when I’ve been travelling or when I’ve had too many events to even manage two days of fasting. And, all in, I’m extremely pleased. I haven’t had to change my lifestyle – I can still eat out, I can still drink (except on fast days) and I even get to eat chocolate when I want to! I don’t find I suffer greatly on the 5-2 diet and I do generally feel better on the day after a fast day. Those cravings for sweet things seem to go a bit and I find I don’t want to eat as much. I’m planning to modify the diet a little for 2013 and try three days a week of fasting where possible because I’ve found that works well if you are trying to lose weight. 500 ml Chicken/Turkey Stock Or water. Don't use too strong a stock. I’ve really enjoyed creating low-calorie 5-2 diet-friendly dishes. 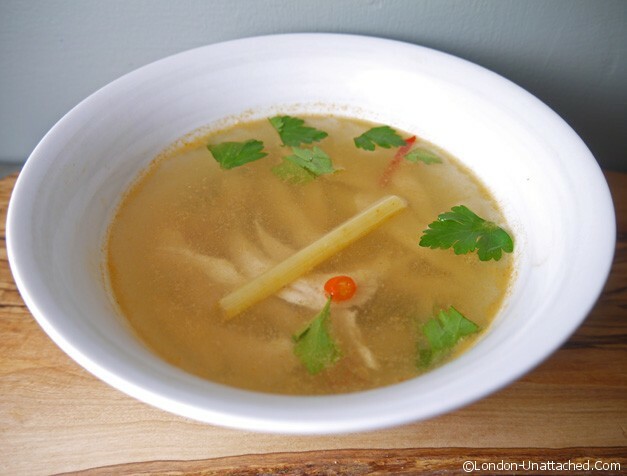 For example, this Tom Yum soup is my attempt at using up some of my turkey left-overs. Although most of us put on weight over Christmas, there are things you can do with your leftover turkey that don’t involve vast quantities of cream or butter. And, it’s a very healthy meat with around 100 calories for 100g (that’s a normal portion). 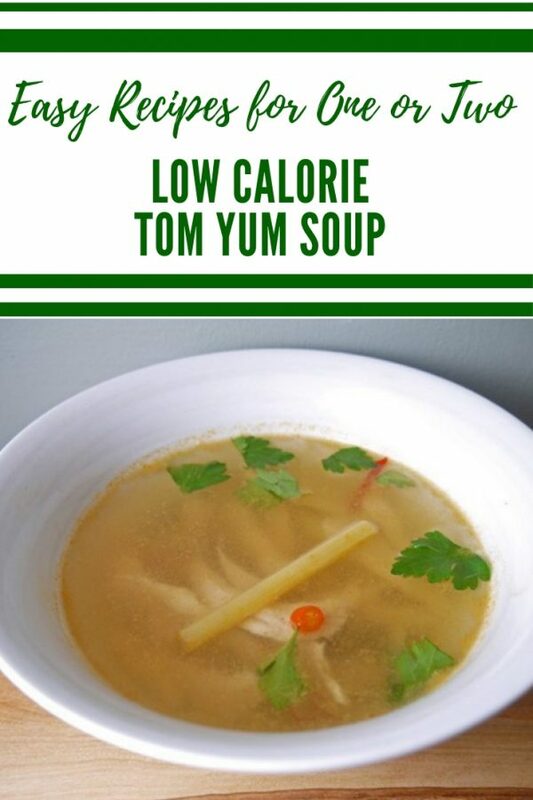 And this quick and easy soup will also work with prawns or chicken breast – and is about 80 calories for a bowl. So cooking low-calorie food for the 5-2 diet doesn’t have to be hard work. If you are still looking for inspiration, do check out the 5-2 diet recipe section of London Unattached. I’m updating it regularly with ideas! This looks so delicious, it’s amazing how low-calorie Thai/Japanese/Asian food can be! Thanks for finally talking about >The 5-2 Diet and Me <Loved it! Hi Fiona, have you had any blood tests redone yet to see what has happened to your fasting glucose and cholesterol levels? Congratulations on your dieting success so far – it seems to be quite adaptable for your busy lifestyle. This recipe sounds great. Always looking for ways to use the turkey leftovers while cutting some of the calories (especially after all the Christmas baking!). Thanks for sharing. It sounds like you’ve had great success with it, Fiona! Congratulations! I think I’d struggle even those two days a week. Twelve pounds in just over four months is fantastic! One of my absolute favourite ways to use up Christmas leftovers – and there is nothing like a spicy bowl of soup on a grey day in London! its such a nice easy soup to make isn’t it! you don’t even need the blitzing machine out!